A few weeks ago I entered a road race, just because it was close to home and I knew the roads. After receiving confirmation I had a place in the race I took a closer look at the course and the entries. 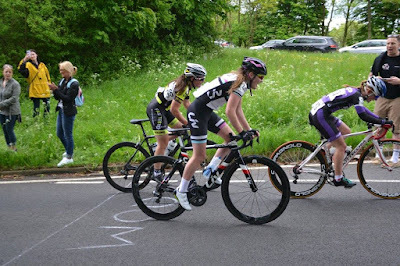 It was a Cat 1,2,3 race, I’m cat 4 currently and to top it off I was going to have to climb Edge Hill in Warwickshire (600m long with a max 14% gradient) 3 times over the 47 mile 3 laps course. And I didn't have a team. I can honestly say I didn’t know what to expect, all I knew was it was going to be hard and fast. The race started at a rapid pace with everyone trying to move up the field to be in the best and safest position. I had positioned myself close to the front ready for the first of the three climbs up edge hill. When we started to climb the pressure really came on with massive group soon breaking up. I was 29th coming up the hill over the QOM (Queen Of the Mountain) line missing the front group of 19 mountain goats. I was now riding in the 2nd group of around 18 riders. The group really worked hard together to try and close the gap to the lead pack and by the time we reached the bottom of Edge for a second time we were within a few seconds of the lead group. However once again the climb broke the groups with a number of the girls coming back to us while the stronger girls pushed on again. To make things worse the weather had turned from a lovely sunny day to torrential rain, hail stones and gusty winds. I was glad in some ways to be riding as the hardy supporters on the top of Edge looked quite battered. I thought it made the race more interesting and quite funny when you hear a few screams of “that hurts” as the hail stones came down. These wet conditions added to the races tough nature and with the potential of slippery roads on the downhill sections I took extra care. Over the top our group slowly reformed now with greater numbers but some 20 seconds down on the leaders. I tried to make sure I did my fair share of the work to try and catch but this was getting tough. On the third lap I crested Edge in 19th place I'm told and although our group worked well we weren't able to close the gap on the leaders. As it got close to the finish the group stopped working and that's when I knew the sprinters would get me. Everyone tried to get in a good position for the small sharp hill which flattened off for 15m to the finish. At this point I could feel my legs burning I dug in but finished 27th, not bad out of 70 starters. I’m very happy with my race and it was another great experience, not being a full on cyclist it is hard to judge were I should finish but being a cat 4 rider against cat 1's and 2's I couldn’t have been happier just to keep up. Thanks to Giant / Liv and Giant Leamington for their support and the Wednesday crowd who all braved the weather and stayed to cheer me on.